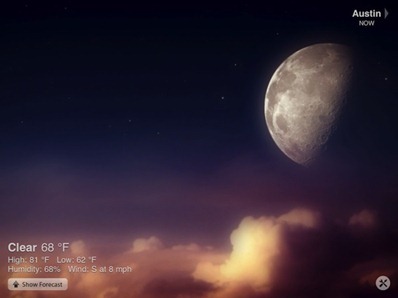 When you launch it, Weather HD presents a quick summary of current conditions – showing the current temperature, the day’s predicted high and low, humidity, and wind, at the bottom left of the screen. Just below that, you can tap to see forecast information for today and three days ahead. The app looks equally stunning in both landscape and portrait modes, and regardless of whether you look at it during the day or night. 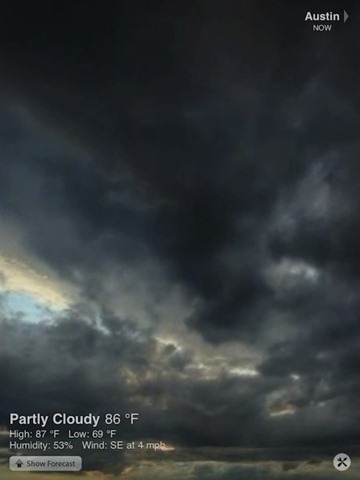 As with nearly all weather apps, you can choose to see weather info for multiple locations – you just add / edit them via Settings as is standard. You can add your current location, or via zip code, or city name. To switch between locations you can use the arrows at the top of the screen or just swipe right or left to go forward or back among them. The App Store page for the app says the next update (Version 1.2) will add hourly forecasts and detailed weather information. 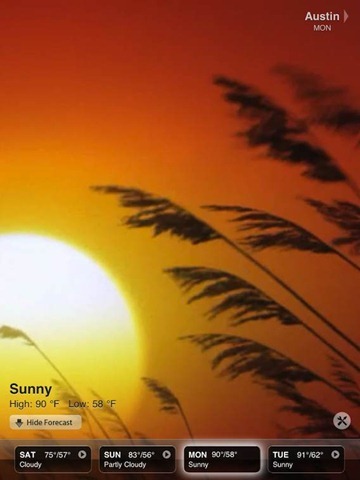 Weather HD is a great weather app if you don’t feel you need tons of detailed weather information, or if you are willing to keep more than one weather app on your iPad – one that lets you see deep details, and one that looks amazing and is great for quick weather status checks. It’s also a real ‘wow factor’ app to show to friends and other iPad owners. 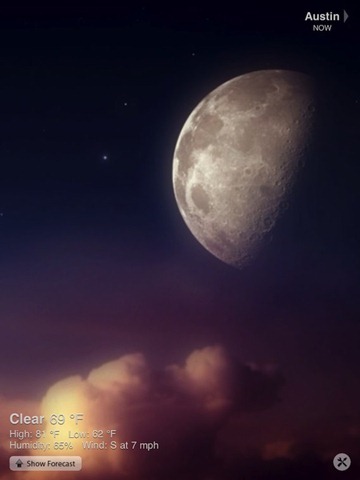 It is my favorite weather app, and has me wanting to check the weather several times a day, even though the next few months here will only vary between Hot, Damn Hot, and OMG It’s Freakin Hot. DOH. 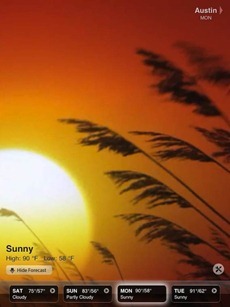 My bad – that was meant to be checking the weather several times a day – have corrected it now. Thanks Honda.